To kick off this (long overdue) first post of 2017, and to reset my own attitude, I'm going to go out on a limb and suggest that everything is going to be OK and we all need to simmer down. I'd also like to suggest that the population of America is not a simple-minded group that is easily edged into two neatly packaged and conveniently polarized factions as many of our politicians and media outlets would like us to believe. I'm going to remind myself that fervor and despair following an election is not unusual in our history, and is necessary to strengthen our democratic processes. And, I'm going to consider what I can do with my own thoughts, actions and interactions to drive my own little sphere of influence forward in a positive and productive way. You innately know what these things are, and they're pretty obvious. A great way to figure out what those things are is to flash forward time and imagine yourself on your death bed and what would be going through your mind. There have been studies on the topic of what dying people regret, and it's generally related to time they didn't spend with the people they loved and instead spent on empty careers, living up to other people's standards and expectations, and chasing things they mistakenly thought would bring them happiness. who was dying of cancer, saying that she'd done everything she could have ever hoped to do, created a wonderful family she loved, and had no desire to spend her last days undergoing chemotherapy in a hospital. "I'd rather die of alcohol poisoning right here with all of you!" were her exact words on the last day I saw her alive. While we can all acknowledge the truth in point #1 above, it's difficult to keep it in the forefront during our busy, demanding lives (and also unhealthy to be constantly imagining yourself on your deathbed, but that's besides the point). 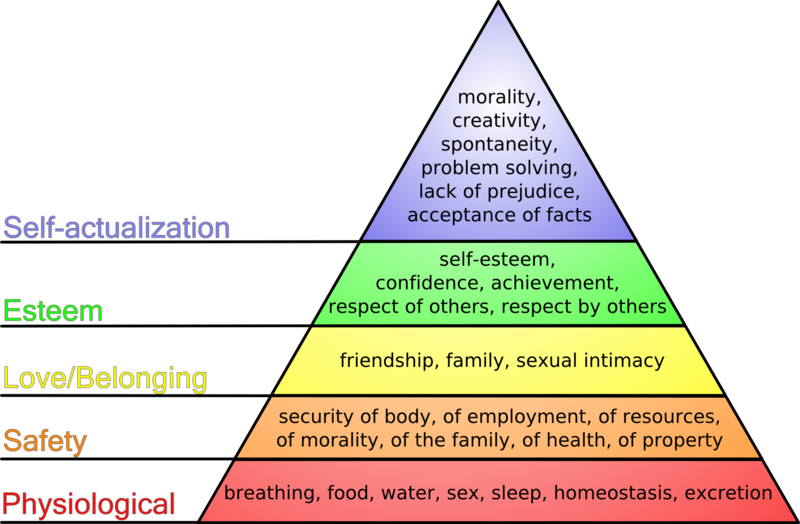 Let's cue Maslow's hierarchy of needs for a moment, and consider what modern psychology has proven we benefit from caring about. Things like putting a roof over our heads and food on our tables, living in safety and security, having a family we love, developing confidence and earning respect, and striving towards higher values pretty much cover the drivers of fulfillment in our lives. Yet we're exhausted and unfulfilled because we stray from focusing our attention on what actually matters. Instead, we waste our f*cks by freaking out in traffic jams, gossiping about our irritating coworkers, worm-holing on Facebook for hours, fixating on past or future choices, obsessing over a mistake or an offhand comment we can't take back, or getting overwhelmed by cleaning our houses filled with stuff we don't need. In addition to all of the time-sucking activities we voluntarily sign ourselves up to care about, we have a whole set of additional time-sucking activities that other people try to force upon us. It is extremely hard to say no to a mentor that tells you to spend more time networking and "building your brand" when you're craving authentic connections at work. It's challenging to say no to a colleague who wants your time, energy and support of a new venture when all you want is to carve out time to go to a yoga class. It is annoying to say no to giving your money to a skincare pyramid scheme your friend joined when you're really satisfied with your current face wash, thank you very much. It's equally difficult to say "no" to ideas, suggestions and feedback about what you should be doing, how you should be spending your time or what you should really value. Here are a few examples I've struggled with: I've had people tell me I have too much time on my hands when I talk about a book I loved. Colleagues have insisted I will have no future unless I invest the time and money into getting an MBA. Friends have told me it's a shame that I waste my time and talent writing this blog, that I need to shift my focus to monetizing it or quit entirely. Certain family members have told me to take a step back in my career, otherwise it would end up hurting my husband and our future family. Instead of saying no to these non-value-added activities and unsolicited suggestions, you feel guilty and do all of the above and consider the ideas that don't line up to your values. After taking the time and energy to care about all of those dumb things you cannot control, you have no energy left to invest in walking your cute dog, or taking a spontaneous road trip with your husband, or calling your wonderful mom or volunteering your time to help youth learn to read, or writing that novel on your bucket list. If you're like me, you tend to ruminate over these things even if you do know that they don't matter. I waste a significant amount of time ruminating, which is yet another thing that detracts from enjoying the moment and the things in my life that are truly worth my energy. As the Souza quote above suggests, time is our only limited resource and it's our prerogative to use it wisely. Spending your time and attention on things that don't add value to your life throws things off balance, causes unnecessary stress and angst, and ultimately prevents you from having the most fulfilling experiences possible. You have to make a conscious decision to change, and learn to start saying no and to stop giving a f*ck about the things that don't really matter. A. Quit Facebook and any other modes of social media that make you care about stupid things. Seriously, it's non-value-added and you'll be amazed how people are still able to contact you by leveraging other modes of communication. No one will artificially remember your birthday, but the best gift will be forgetting the names of people who you should have omitted from memory in 8th grade. I've been off the 'book since 2012 and can honestly say that when people complain about seeing ultrasound images of the fetuses of distant acquaintances, I cannot relate. B. Offload all of the commitments you currently have but don't really want. Also opt out of any optional activities that you feel obligated to partake but don't really understand the value. We're told never to give up under any circumstance, and I think this is bogus. So does Mark Manson. Giving up the right things can set you free! Or, at least will set your time free to reinvest in something you actually care about. C. Train yourself to say no in creative ways. When someone makes a suggestion or gives advice that you don't value, simple say "Thank you for your input, I'll consider that" and don't let it take hold in your mind. If someone asks you to do something that you don't care to do: Say, "Thank you for thinking of me for this. Let me consider that and get back to you." Then, simply follow up with a brief, polite "No thank you." Ok, that's all I have for today. I'd love to hear your thoughts on this topic, and what works well for you when it comes to staying focused on the things that you care about. And if you totally disagree and hate this whole post, let me know that too!